On the Raptor Ridge photo from left are: Chuck Banker, Charlie Kahle, Elmar Zanforlin, Brenda Marshall, Bobbie Wright, Craig Robertson, Werner Berger. 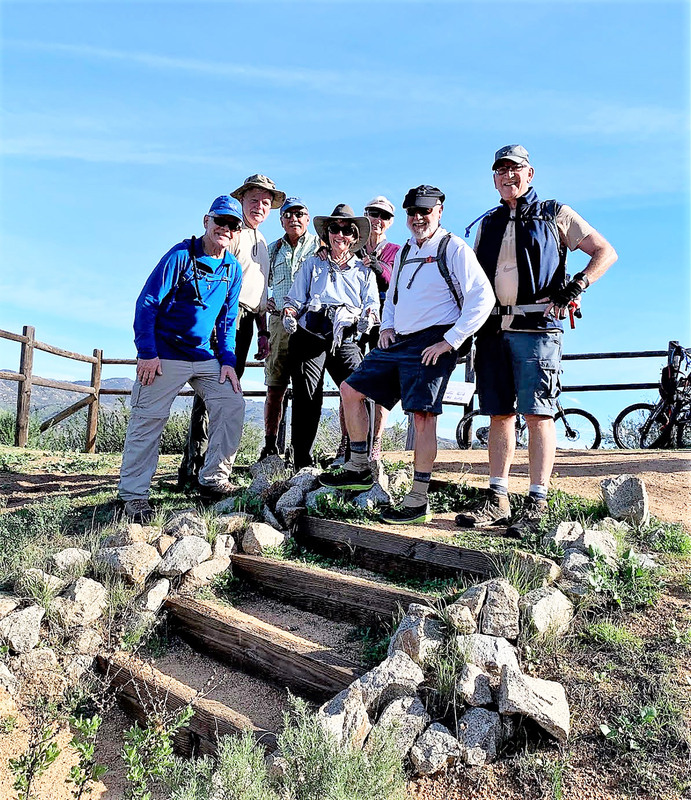 Seven long-time senior friends, including two from Escondido, completed the Coast to Crest Challenge (C2C Trail Challenge) together in one day on January 27. The San Dieguito River Valley Conservancy initiated the Coast to Crest Challenge in July 2017, partnering with REI, challenging hikers to hike five designated trails over a one-year period, take a selfie at each and then email all their selfies for verification. To date, the Conservancy has issued two Challenges and 400 people of all ages have taken the Challenge. Ranging in age from 58 to 72, the hikers who took this one-day group challenge are: Chuck Banker, from Lakeside; Charlie Kahle, from Escondido; Elmar Zanforlin, from Beaumont; Brenda Marshall, from San Marcos; Bobbie Wright, from Vista; Craig Robertson, from Vista and Werner Berger, from Escondido. It was Kahle’s idea to accept this challenge for the group which has been hiking together for several years, and are known as “Bobbie’s group” because she is “the glue” that keeps them all together, organizing most of the hikes the group does. Together they have done many demanding one-day hikes, including multiple times to the summit of Mt. Whitney, rim-to-rim on the Grand Canyon, Cactus-to-Clouds at San Jacinto, the Adventure 16 3-Peak Challenge in 24 hours, plus trails on all the big mountain peaks in Southern California. So when Kahle heard about the C2C Trail Challenge, it was just natural to consider doing it in a day. They started at 6 a.m. on the Santa Fe Trail and finished at 3:30 p.m. on the Santa Ysabel East Preserve Kanaka Loop Trail, having hiked 23.7 miles, averaging 3.5 mph on the trails, which was much better than Kahle’s worst-case calculation. All the trails being out-and-back made it easy to carpool between the trailheads. And it was also easy to keep fueled up and hydrated, as they had coolers in their vehicles for water and other trail drinks, plus snacks, sandwiches, etc., to eat on the drive between hike trailheads. To celebrate they enjoyed a meal together in Santa Ysabel. “Some of us feel you can’t beat a burger and a beer after a great hike!” said Kahle. It’s also, a great way to swap stories about the hike and to plan their next adventure. “We all get along great, so we share lots of laughs both on and off the trails,” she said. The group agreed it was wonderful to see the various habitats, scenery, and animals (deer, coyotes, ground squirrels, birds, cows, etc.) as they traversed the trails from the coast to the mountains. Kahle said he hopes their story will inspire others to take the Challenge and get out and enjoy the awesome outdoor beauty that San Diego County has to offer! Maybe even cause an uptick in those doing the Challenge in a day! This is the second group that has taken the Challenge in one day. On April 21, 2018, four fifty-something friends “who like to do stupid things” took the Challenge. Enthusiasts for the Challenge are encouraged to share their selfies and other photos on Instagram and Facebook with the hashtag #C2CChallenge.